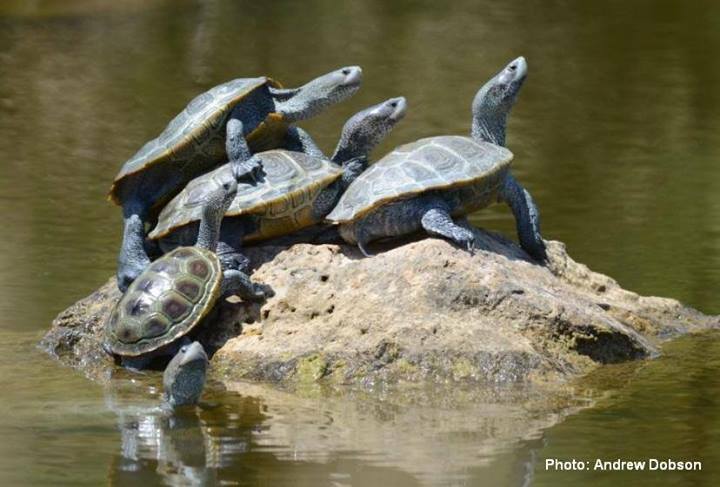 A group of Diamondback Terrapins — which have been described as a globally near-threatened species — were caught “sun bathing” on a rock in Bermuda recently. Indications are that there are less than 100 adult Terrapins living in Bermuda, who are believed to be the only population breeding in the wild outside of the continental United States. The species is being studied, with Bermuda Zoological Society saying: “The Diamondback Terrapin Project was initiated in 2006 by Bermudian scientist Mark Outerbridge to fill enormous gaps in our knowledge of a species that had been added to Bermuda’s native fauna list. “Diamondback terrapins have been described as a globally near-threatened species by the International Union for Conservation of Natural Resources. On the east coast of the U.S. (where this species is endemic) their status ranges from a species of special concern to endangered in some states. “The Bermuda population of diamondback terrapins is localized to only one small area on the island (Mangrove Lake, Trott’s Pond, and South Pond). The results of a three-year mark and recapture population survey suggest that there are less than 100 adults living in Bermuda. I’ve seen these “byes” swimming in salt water as well believe it or not. Up by Black Bay in Southampton. I didn’t know they could withstand salt water? Are you sure they are Diamondback Terrapins?